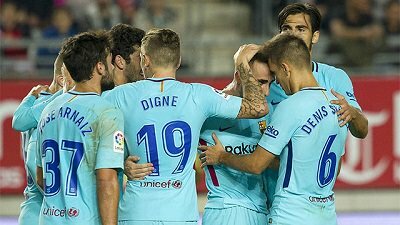 Paco Alcacer, Gerard Deulofeu and Jose Manuel Arnaiz, making his first team debut, all scored to give Barça the first leg advantage. These two sides will meet at the Camp Nou for the second leg on November 29, 2017. This result means that Barça remain unbeaten, with 12 wins and a draw in all competitions. Next up for the Blaugrana is a trip to Basque country to face Athletic on Satuday. REAL MURCIA: Santomé, Escribano, Juanfra, Orfila, Álex, Mateos (Armando, 76′), Nadjib, Jordan, Elady, Llorente (David Sánchez, 60′) & Molinero (Chamorro, 60′). FC BARCELONA: Cillessen, Semedo, Mascherano, Vermaelen, Digne (Cucurella, 83′), André Gomes, Aleñá (Rakitic, 76′), Denis Suárez, Deulofeu (Sergi Roberto, 76′), Alcácer & Arnaiz. Goals: 0-1, Paco Alcácer (44′). 0-2, Deulofeu (53′). 0-3, Arnaiz (56′). Referee: José Luis Munuera Montero (andaluz). Previous PostBarça remain league leaders after defeating Malaga 2-0. Next PostBarça defeat Athletic 2-0 to remain unbeaten.